Occassionally, when we are using a set of data, there may be mistakes. Before we can really make any decisions or visualizations using that data, we must ensure it is as accurate as possible. In this post, we will look at using the R library stringr to filter out unwanted data. 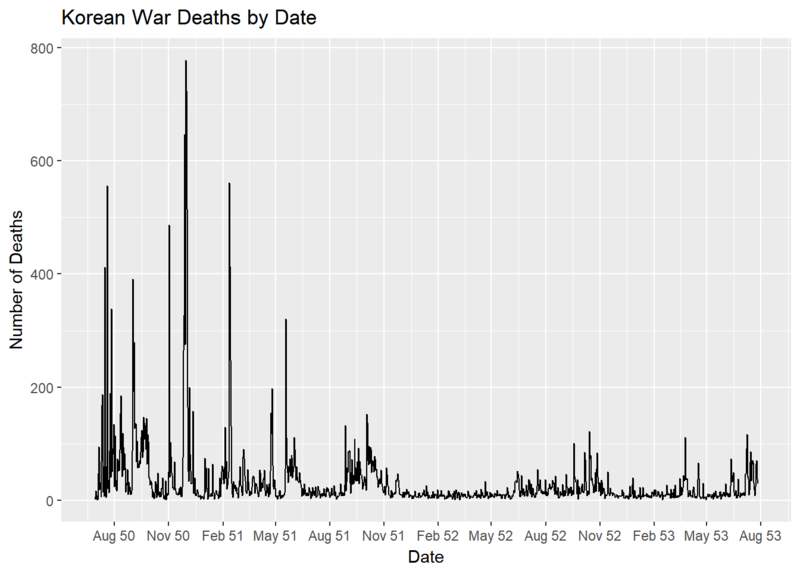 For this example, we will be using a data set from (Kaggle.com)[https://www.kaggle.com/orangutan/exploratory-analysis-of-the-korean-war] that contains all the US deaths from the Korean War. First, we import our libraries and look at the first few rows of data. It appears that the INCIDENT_DATE field is formatted like so: YYYYMMDD. To check this, let’s compare the total number of rows in the database with how many rows fit that format. To keep things simple, we will use a regular expression to check that the data contains only 8 numbers. This is an acceptable number of valid records (36,511 out of 36,574), so we can just filter out the remaining bad data and begin to use our data for visualizations and decision making. Now we can plot out a simple line chart of deaths by date using this newly cleaned data set.